At QualitySolicitors we do everything we can to give great customer service. That’s why we offer clear pricing upfront (so no nasty surprises on our bills) and it’s why we also do all we can to ensure you always feel in control. If you’re looking for expert solicitors in the Chester area, our Free Initial Assessment is the perfect way of chatting to us for free to see if we’re right for you. Feel free to call any of the QualitySolicitors law firms below, or our national freephone number 08082747557 is available if you want to know more about us. Chester Is a small city in Cheshire, England with a population of around 118,000 people, and is close to the border with Wales. 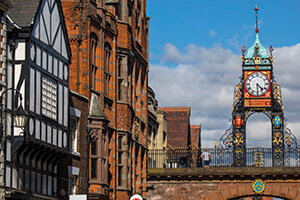 Chester is a walled city, and was originally founded as a Roman fort. It became a major civilian settlement during the Roman era, and was one of the last cities in England to fall to the Normans during the Norman Conquest during the 11th Century. It is still one of the best preserved examples of a walled city in the UK and has a number of medieval buildings as well as a large number of Victorian era architecture. Nowadays, Chester is a popular tourist city and has a number of tourist attractions, mainly driven by it’s interesting architectural heritage. There is a large shopping centre in the centre, with an indoor market.